Get under the sun with your sweetheart and take in some nature. A details of a California State Parks Valentine. Want to hike, ramble, and/or be in the fresh air with your paramour on Feb. 14? Our parks system has ideas. PICTURE THIS: When you think of our national park system and the California State Parks, do you picture two tree-loving titans of nature-tastic majesty? Do you see twin engines encouraging people to get outside to a place where they might feel dappling sunbeams pouring down through a pine's gentle branches, light that falls gently upon their inside-too-often faces? It is a duo of mammoth proportions, so we, for one, would never suggest one or over the other. When we're in a national park we simultaneously wish we had a foot in a state park, and vice versa. Call it Wanting-to-Be-Everywhere-All-at-Once-itis, and all nature lovers have it, from time to time; you're at the beach and you desire mountains, you're in the desert and you want snow. So let us love upon both as we head into the mondo, three-day, Valentine's and Presidents Day and Mardi Gras Weekend 2015. The national parks will be fee-free, at least those that charge entrance fees, and California State Parks? Well, they've kindly recommended some good spots to go with your sweetheart, if you want to partake in the majesty of the wild world with someone who makes your heart go thumpity-thump. THUMPITY-THUMP... is also a reaction many people have in nature, and thank goodness: It excites. Take, for instance, the possible viewing of bald eagles during a free bald eagle barge tour at Silverwood Lake State Recreation Area, one of the California Parks recommendations for a Valentine's excursion. Or a bird walk at the Tijuana River Estuary Reserve, which happens on the second and fourth Saturdays of each month (another hearts-afire pick from the State Parks people). Or one of the suggestions State Park fans are leaving on the official Facebook page. Why can't Valentine's and the outdoors go hand-in-hand? It isn't a holiday just about dancing and low-lit dinners, two activities, we'd like to kindly point out, that can happen near a tree, a river, or in loads of outdoorsy spots. (We'd use a mini flashlight in place of a candle, but that's just us.) So, to go national or state during this long, play-in-a-park, holiday-filled three-day weekend? Oh, let's just do both. 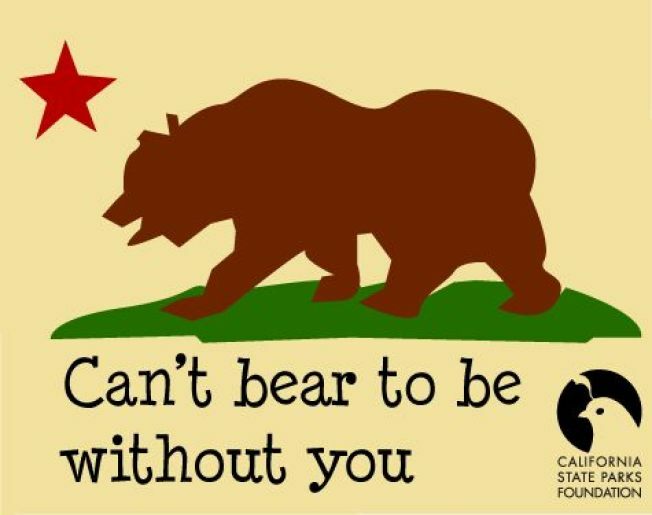 AND DON'T FORGET... these adorable Valentines that California State Parks posted last year. We'd send them to our honey as an invitation to hike.